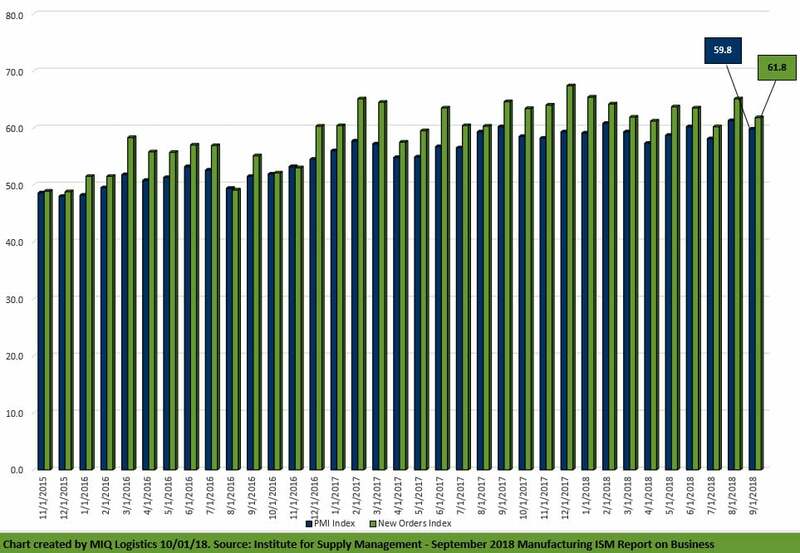 Economic activity in the manufacturing sector expanded in September, and the overall economy grew for the 113th consecutive month, say the nation’s supply executives in the latest Manufacturing ISM® Report On Business®. The report was issued today by Timothy R. Fiore, CPSM, C.P.M., Chair of the Institute for Supply Management® (ISM®) Manufacturing Business Survey Committee: “The September PMI® registered 59.8 percent, a decrease of 1.5 percentage points from the August reading of 61.3 percent. The New Orders Index registered 61.8 percent, a decrease of 3.3 percentage points from the August reading of 65.1 percent. The Production Index registered 63.9 percent, a 0.6 percentage point increase compared to the August reading of 63.3 percent. The Employment Index registered 58.8 percent, an increase of 0.3 percentage point from the August reading of 58.5 percent. The Supplier Deliveries Index registered 61.1 percent, a 3.4-percentage point decrease from the August reading of 64.5 percent. The Inventories Index registered 53.3 percent, a decrease of 2.1 percentage points from the August reading of 55.4 percent. The Prices Index registered 66.9 percent in September, a 5.2-percentage point decrease from the August reading of 72.1 percent, indicating higher raw materials prices for the 31st consecutive month. “Comments from the panel reflect continued expanding business strength. Demand remains strong, with the New Orders Index at 60 percent or above for the 17th straight month, and the Customers’ Inventories Index remaining low. The Backlog of Orders Index continued to expand, but at lower levels compared to the previous month. Consumption improved, with production and employment continuing to expand, at higher levels compared to August, despite shortages in labor and materials. Inputs — expressed as supplier deliveries (decreased), inventories and imports — improved compared to the previous month’s activity. But continued supply chain inefficiencies led to an increased consumption of inventory and a slight expansion of imports, which adequately supported production output. Lead-time extensions, steel and aluminum disruptions, supplier labor issues, and transportation difficulties continue to limit potential, but at more manageable levels. “Export orders expanded, but four major industries are no longer contributing. Price pressure continues, but the index softened for the fourth straight month and dropped below 70 for the first time since December 2017. Demand remains robust, but employment resources and supply chains continue to struggle, but to a lesser degree. Respondents are again overwhelmingly concerned about tariff-related activity, including how reciprocal tariffs will impact company revenue and current manufacturing locations,” says Fiore. Of the 18 manufacturing industries, 15 reported growth in September, in the following order: Textile Mills; Miscellaneous Manufacturing; Plastics & Rubber Products; Computer & Electronic Products; Food, Beverage & Tobacco Products; Machinery; Apparel, Leather & Allied Products; Paper Products; Electrical Equipment, Appliances & Components; Chemical Products; Petroleum & Coal Products; Transportation Equipment; Furniture & Related Products; Fabricated Metal Products; and Nonmetallic Mineral Products. The only industry reporting contraction in September is Primary Metals.